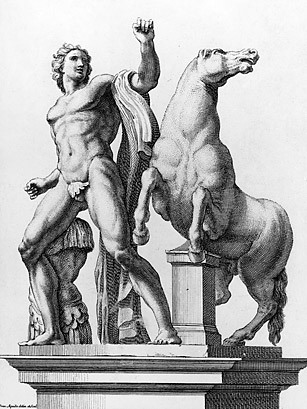 Bucephalus was the famed steed of Alexander the Great. As legend has it, Alexander broke the wild horse when no one else dared go near  not by force but by turning the horse's head toward the sun, understanding that Bucephalus was simply afraid of his own shadow. No one but Alexander could mount the horse after. As one history puts it, "Long did this noble animal share the toils and dangers of his master; and this was the horse that Alexander delighted to honor." So excellent was Buchephalus in battle that when he was once lost, Alexander is said to have threatened the destruction of an entire country unless he was returned (which he was).